With four extra pages compared to 2016 and over €80,000 to be won the new edition of the Iverk Show prize list is packed with competitions for everyone. The prize list gives the schedule of classes and events due to take place at the show. Launching the prize list chairman Robert Dowley said that while it was difficult to improve on last year’s very successful event he was confident that we have put together an even better programme. With some new events and most of the old favourites the show promises to once again achieve the objectives of its founders in 1826. With the support of Glanbia the ‘Iverk Show Food Market’ is set to take centre stage. Hosted by Chef Adrian and the ICA and sponsored by FloGas and NordMende the All Ireland Home Cook Champion 2017 final will be a spectacular competition. Finalists have already qualified in Kilkenny and at Ballymoney and Clonakilty shows. Now in its fifth year and already established as one of the biggest cattle competitions in the country is the Aldi, ABP sponsored Irish Angus bull calf championship final. Nissan are back in the show jumping Grand Prix as is Investec Wealth and Investment All Ireland broodmare final. There will be a new novice class for working hunter horses. The highlights in the cattle section are the Johnson Hygiene Championship, the Ulster Bank inter breed beef championship and the Dawn Meats non-pedigree heifer. There will be 41 classes in the Red Mills poultry marquee housed in beautiful new KLP aided cages. There will be hard, soft and heavy feathered birds as well as water fowl and bantams. Entering the show grounds you will see the fruit, vegetable, eggs, flowers and honey classes. Beside these will come the backing section with of course the Iverk Produce great cherry cake competition. The arts, crafts, photography and flower arranging classes both adult and young people are testament to the creative skills of the exhibitor. Many are just brilliant. Last year the fashion marquee was packed to the doors and Anne Marie and her helper promise even better this year. Talking about fashion, ladies would you like to win an overnight, dinner, B and B in the five star Merrion Hotel in Dublin with some spending money in Louise Kennedy’s? And if you are under 18 months of age make sure your parents turn you out at your best as there are prizes for all that take part in the Bonny Baby competition. Your day would not be complete without a visit to the vintage section. It will rekindle memories for many of you. 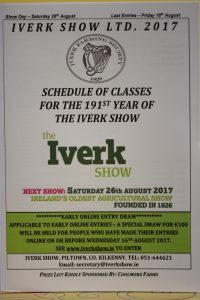 You will find the full show Prize List on our website www.iverkshow.ie or contact 051 644621Make sure you put the 26th August in your diary now – a day not to be missed.